Throughout the last decade, the phrase cloud computing — web-centered computing in which services, including apps, and storage and security, are hosted via the Internet — has become standard in the software-industry lexicon. Enterprising organizations are aware of the mounting costs and complexities of maintaining a secure applications environment and are eager for greater freedom to focus on their core business capabilities. Forward-thinking leadership teams are turning to cloud-based trucking software solutions along with hosting services to manage and protect their operations software environment, rather than on relying on internal hard drives. • Evaluates your current infrastructure to identify areas needing improvement. Determines your company can benefit from cloud-based trucking software. • Delivers a customized plan. Some organizations unwisely disregard this essential step, selecting an all-purpose plan as a way to save money. When the utmost performance and protection are required, a standard one-size hosting solution is unacceptable. • Updates you on advances in transportation management technology. • Introduces solutions that help as you build your business. • Shields your information and, by extension, your professional reputation with comprehensive protections via multiple, redundant data paths and power sources. It’s this combination of technological expertise and real-world knowledge that will enhance your company’s performance and your business satisfaction. As a TMW customer, your server processing and data storage will happen in our secure, advanced technology centers, expressly designed for TMW application hosting. Your information is fully protected, ensuring your servers and applications remain available. And, you can count on expected and affordable monthly pricing along reduced capital expenditures to better manage IT costs. The goal is to maintain the most uptime throughout the year and minimize the time to recover when systems are down. 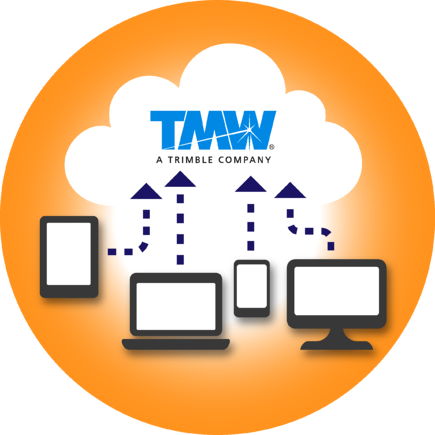 Having TMW Cloud Services host your TMW trucking software means we are able to work directly with our software support teams, taking your IT staff out of the equation as the middleman between the hardware vendor and software support. This means much faster ticket resolution and ultimately more uptime throughout the year. Our uptime for 2016* has been 100% with 2014 and 2015 at 99.997% and 99.998% uptime respectively. We are dedicated to maintaining an enterprise-grade, mission-critical environment for our clients. Cloud hosting with TMW is a proven option for you and moving to the cloud will save you money. With more than 500 customers using our services and solutions, it’s no longer a matter of will you move to cloud hosting, it a question of when. Why not let an established provider shoulder the burden related to IT infrastructure, applications and personnel while you focus on other business matters? Download our free information now.